The Flood's annual lock in for 6th-8th grade students will be on Friday-Saturday, January 18th-19th. Doors open at 9:00pm and the event ends at 7:00am Saturday morning. 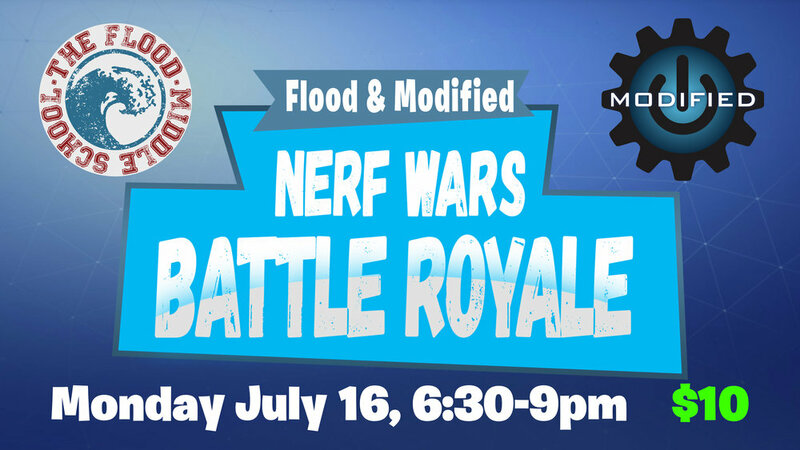 This event is held at South Lansing Christian Church, with the exception of the late night trip to Zap Zone! Total cost is $25 per student, which covers Zap Zone (Laser Tag, Glo Golf, "Springz/Trampolines"), late night dinner, breakfast and snacks. Students may bring extra money for tokens at Zap Zone if they want to play arcade games. Students will need to bring a copy of the Lock-In Permission Form with them to be admitted to the lock-in. If students want to participate in the optional "Springz/Trampolines" at Zap Zone, they need to have the Springz Permission Form filled out. If you have any questions, please email Josh. The Flood will be taking a break from December 20th-January 3rd. We'll meet on Wednesday night, January 10th from 6:30-8:15pm! You're welcome to join us on Christmas Eve at 6pm for our candlelight service. It’s going to be an outdoor summer party you won’t want to miss! Here's what's happening at The Flood from January to April of 2017! As always, if you have questions, email Josh. Wondering what's happening over the next four months? Look no further!